Petrus Christus was a 15th-century Flemish painter associated with the city of Bruges. His style relates to that of Jan van Eyck, from whom he derived his models while simplifying Van Eyck's compositional structures. His work also reveals a knowledge of Rogier van der Weyden in the organisation of the subjects and the expressivity of the figures. The subject of The Virgin of the dry Tree, which was first attributed to Christus by Grete Ring in 1919, is an uncommon one. It relates to the Confraternity of Our Lady of the dry Tree, to which the artist and his wife belonged. It is likely that a member of this confraternity would have commissioned the painting for the purpose of private devotion, or perhaps it was intended for the artist himself. In this small panel the painter symbolically depicts the message of Redemption through the reference to the dry tree in the Book of Ezekiel and hence to the notion of Mary as the New Eve. The tree has been interpreted as the Tree of Knowledge, which withered following the Original Sin then flowered again with the conception of Christ. The Infant Christ is shown as the Saviour of Mankind, holding the orb crowned with the cross. This small panel, which was in a private Belgian collection at the beginning of the 20th -century, was attributed by Grete Ring in 1919 to Petrus Christus. The panel’s iconography is highly unusual and was only used on this one occasion by the artist. This iconography is then repeated with variants in later compositions by other artists, including seals, such as the one in the Municipal Archive in Brussels; medals, such as the examples in the Bibliothèque royale Albert I in Brussels; or more directly in paintings, for example, the central panel of a triptych on the same subject by Pieter Claessen in the church of Saint Walburga in Bruges, dated 1620. Claessen, however, set the composition in a broad landscape with a high viewpoint in which the dry tree with the Virgin and Christ Child forms the central axis. Prior to 1919 The Virgin of the dry Tree was in the Ernst Oppler collection in Berlin. Around 1937 it was in the Fritz Thyssen collection in Mülheim, remaining with Thyssen’s heirs until the 1960s. It passed into the collection of Konrad Adenauer then entered the Thyssen-Bornemisza collection in 1965 following its acquisition by Baron Hans Heinrich. The subject can be directly related to the Confraternity of Our Lady of the dry Tree, whose members included Petrus Christus and his wife, who became members around 1462. This confraternity, which is mentioned in a document of 1396, had a chapel in the Franciscan church of the Minorites in Bruges, which was destroyed in 1578 during the religious wars. Among the confraternity’s most important members were the Dukes of Burgundy and other leading members of political and civil life in Bruges. According to 18th-century accounts of little historical credibility, the confraternity was in fact founded by Philip the Good. It was said that before the Duke entered battle against the French, the Virgin and Child appeared to him in the trunk of a dry tree. Philip prayed for victory in front of the image, which was granted to him. The story ends with the foundation of the confraternity in thanks for and commemoration of the victory. In this tiny oil on panel Christus, perhaps on the request of the patron, represented the message of Redemption implicit in this particular, symbolic presentation of the Virgin and Child. The key to the iconographic interpretation of the Virgin in this work is to be found in the Book of Ezekiel. 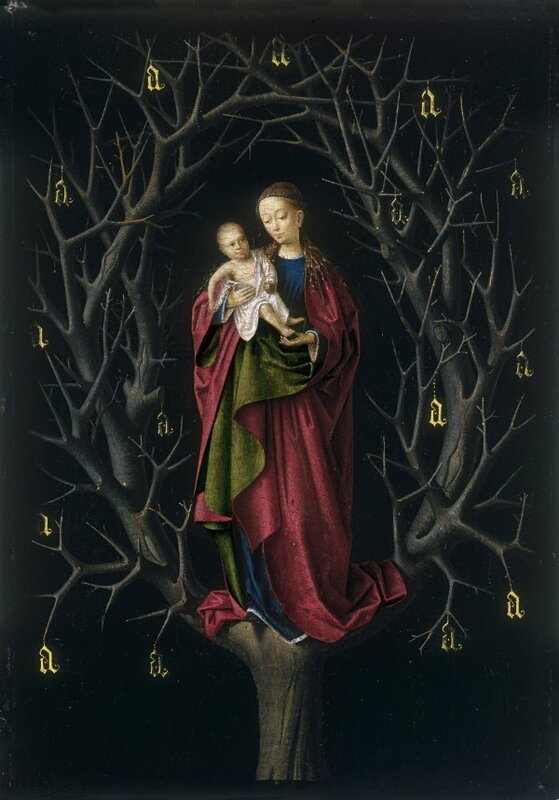 The words “I the Lord [...] have dried up the green tree, and have made the dry tree to flourish” were interpreted as a clear reference to Original Sin and to Mary’s role as the New Eve. The dry tree is identified with the Tree of Knowledge, which withered following the Original Sin but which would flower again through Christ’s conception. Another of the sources that has been referred to with regard to the interpretation of this panel is a text by Guillaume de Deguileville of 1300 in which the same idea is expressed in metaphorical terms. The message is emphasised in the present panel through the depiction of the Infant Christ, who holds an earthly sphere crowned with a cross in a clear allusion to his role as man’s Redeemer. In addition, the bent and interlaced dry branches of the tree assume the shape of a crown that clearly refers to his future Passion. Hanging from the branches are fifteen golden “As” that symbolize the first letter of the Ave Maria or “Hail Mary”. The number fifteen has been related to the mysteries of the rosary, used to pray to Mary, the intercessor between man and God. The present panel may have been commissioned by a member of the confraternity for the purpose of private devotion, or it could have been painted by Christus for his own use as a member of that confraternity, whose activities focused on charitable works and which also venerated the Immaculate Conception. From its high degree of finish it seems likely that the painting was conceived as a precious object, again suggested in the clear emphasis on materials and textures. The figures, with their rounded heads and firmly defined features, exemplify Christus’ best work. The figure types are inspired by Jan van Eyck, whom Christus imitated in some of his paintings, and by Rogier van der Weyden, from whom the artist derived his manner of expressing emotions. Van Eyck’s influence is evident in the Virgin and Child group, which may be inspired by the famous Virgin and Child at the Fountain (Antwerp, Musée Royal des Beaux-Arts). The influence of both artists is to be detected in Christus’ final period, from which the present panel dates.